Between 1978 and 1983 using the bus services run by the subsidiaries of the state owned National Bus Company, a ‘National Wanderbus’ ticket could take you almost anywhere in England and Wales. A long day out with a ‘National Wanderbus’ ticket usually required a certain amount of planning with a map and a set of timetables, along with a ‘plan B’ in mind should the journey become endangered by late (or even failed) runnings. However, my most memorable trip was one which was totally unplanned. A London Country ‘AN’ Leyland Atlantean, one of Crawley’s allocation decorated for the town’s ‘C-Line’ network of local services. Turning up at Crawley Bus Station early on 26th August 1982 I decided to see how far I could get simply by heading off in a westerly direction. 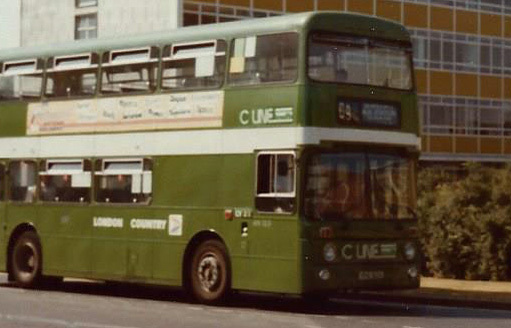 My first bus at 07.33, a London Country Leyland Atlantean working the C1 town service took me to Crawley bus station. Crawley’s local C-Line services used fareboxes and didn’t issue tickets, the pre-printed ‘Wanderbus’ ticket bought the day before was essential to avoid paying the 30p flat fare. At 07.49 another London Country Atlantean on route 438 took me to Horsham. LCBS was one of the few NBC subsidiaries to favour the Atlantean over the Bristol VR as their standard double-decker, in their final form they were excellent machines. Southdown couldn’t tempt me with much at Horsham, westbound services being patchy and infrequent. 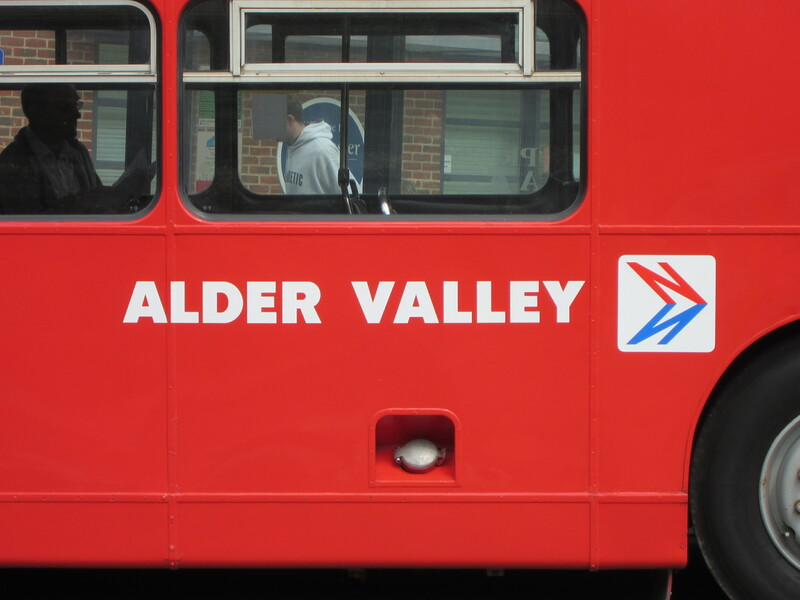 So I chose Alder Valley to take me onwards to Guildford, a Leyland National on route 283 and the first red bus of the day. The timetable displays at Guildford’s Friary Bus Station read like a menu. Farnham, Basingstoke, Godalming, Petersfield, London Country/Green Line could take me back into Surrey or London but I wanted to head west. Then among the Alder Valley departures I struck gold: Service 214 to Winchester, leaving in five minutes at 09.45. 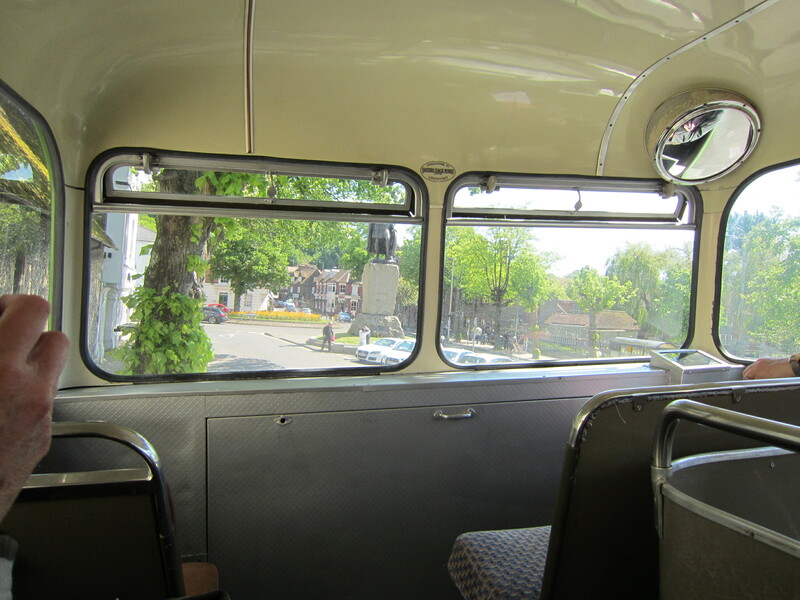 In no time at all I’d settled into a front window seat on the top deck, admiring the view as the sturdy red Bristol VR made it’s way along the Hogs Back to Farnham, then on a gorgeous rural ride through Alton, Alresford, Kings Worthy and into Winchester. Arriving at Winchester I’d crossed a bus operator’s boundary, I was now in Hants And Dorset territory. There was always something strangely exciting about crossing such boundaries in NBC days. I don’t know why though. Hants And Dorset’s fleet were in the same poppy red as Alder Valley’s, but between them the buses managed to look slightly different, the way that the advertising posters were placed on them, the different typefaces used on destination blinds, subtle differences that maybe only a bus nut like me would notice. 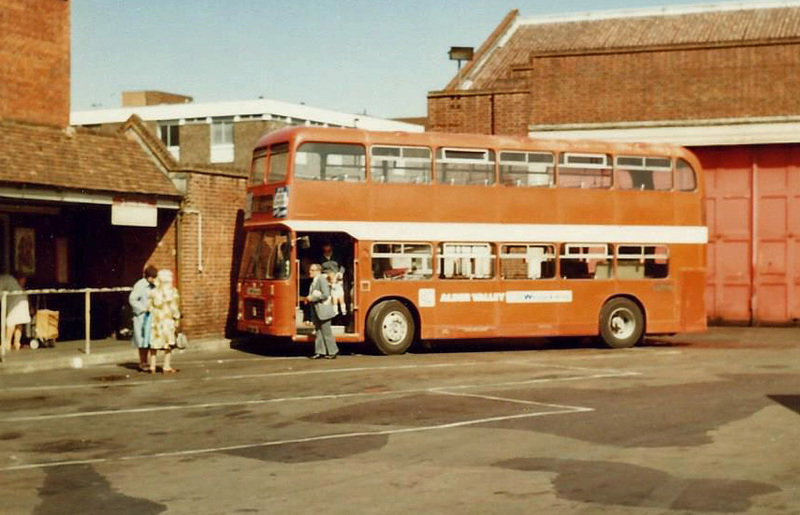 An Alder Valley Bristol VRT arrives at Winchester Bus Station from Guildford on route 214. From here, Hants And Dorset could take me to Salisbury, Basingstoke, Eastleigh or Romsey. For me though, it was their 47 service to Southampton, another Bristol VR leaving at 12.00. When I repeated this trip in 1983, Hants And Dorset had been split into three companies by the NBC, the Southampton and Winchester section now renamed Hampshire Bus. 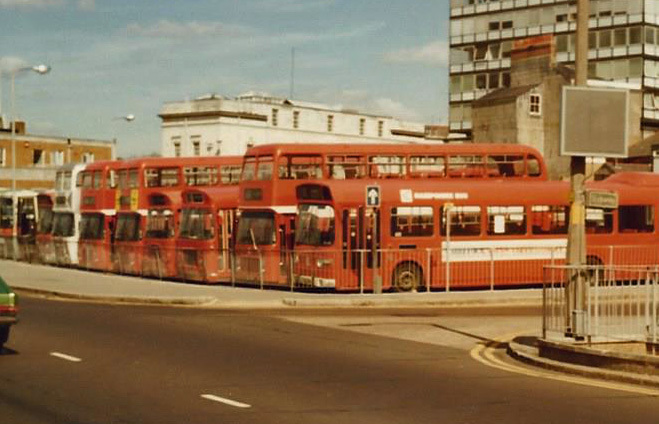 A line of Bristol VRs, LHs and a Leyland National occupy the parking area at Southampton Bus Station. This being a day trip, the next logical move would have been to accept Southampton as my furthest westerly point and turn back, maybe the limited stop service to Portsmouth to catch Southdown’s 700 along the coast to Brighton, but no. A Hants and Dorset dual purpose Leyland National was waiting to depart at 13.25 for Bournemouth, the afternoon was young, it just had to be done. After downing a sausage roll and a can of coke from the bus station cafe I was sitting on the aforementioned Leyland National enjoying the delights of the New Forest as the bus shared the back roads with the ponies. 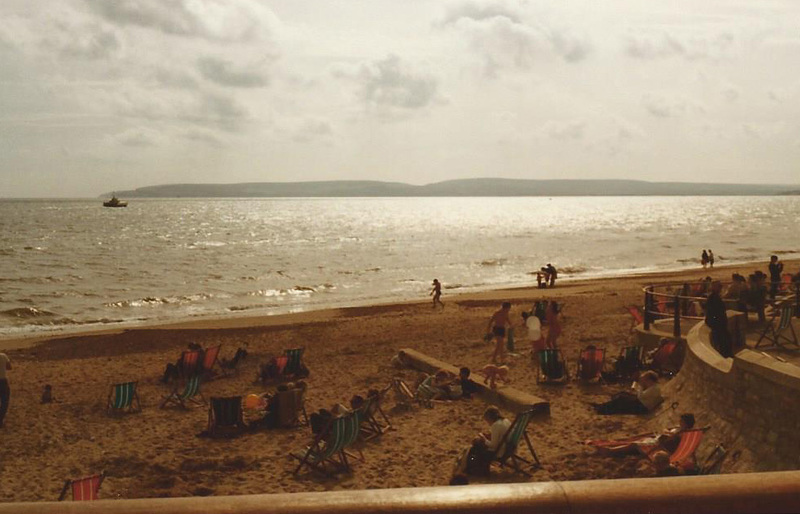 I stepped off the bus close to Bournemouth pier just after 14.45, the hills of Purbeck and the Needles on the Isle of Wight both seemingly within touching distance. Had I really come this far by simply stepping on my local C1 at Crawley this morning? One thing was very clear though, I’d reached a point of no return, going back the same way, or any way by bus was out of the question. I’d made a ‘plan B’ for this by bringing extra money for a rail fare back home. Bournemouth, I’d decided, was as far as I could reasonably expect to travel west from Crawley for £2.97. 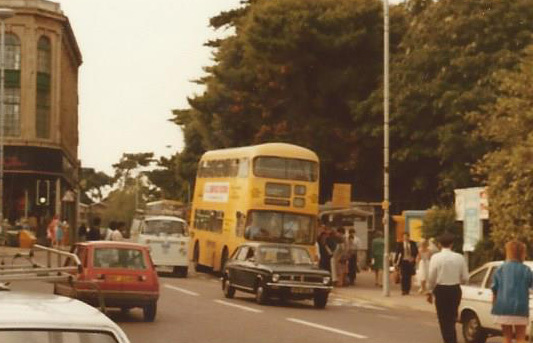 The first of two ‘non NBC’ journeys of the day, Bournemouth Corporation’s ‘Yellow Buses’ take me to the rail station. After a short stroll along the beach I boarded a Bournemouth Corporation’Yellow Buses’ Daimler Fleetline to the rail station (I had to pay normal fare on this one being a non NBC service), then boarding a fast train to London Waterloo, transferring to Victoria on Red Arrow 507 (another Leyland National but a series 2 version and paying full fare again, my ‘Wanderbus’ ticket not being valid on LT services), then a short walk to Victoria Coach Station to board the joint Green Line/Southdown ‘Flightline 777’ back to Crawley departing at 18.10. Showing the ‘Wanderbus’ ticket to the driver it was hard to believe that it was last presented to a Hants and Dorset driver in Southampton and I was now on a Southdown express service in London. In fact, as the Leyland Leopard coach made it’s way through the crowded streets of South London the rural meandering roads and byways of Hampshire and Dorset seemed a world away, despite the fact that I was still using the same day ticket and this was still included in my £2.97 outlay! At 19.42, twelve hours and nine minutes after boarding my first bus London Country C1 took me back home. Crawley to Bournemouth can be driven in approximately two and a half hours, but not for £2.97, even back in 1982. By bus it had taken me just over seven hours, but the slow pace of the journey allowed me to take in and digest every change in the scenery, the subtle changes in local accents and the progressively slower pace of life as I headed further west. The London end of the journey was a massive shock to the system. 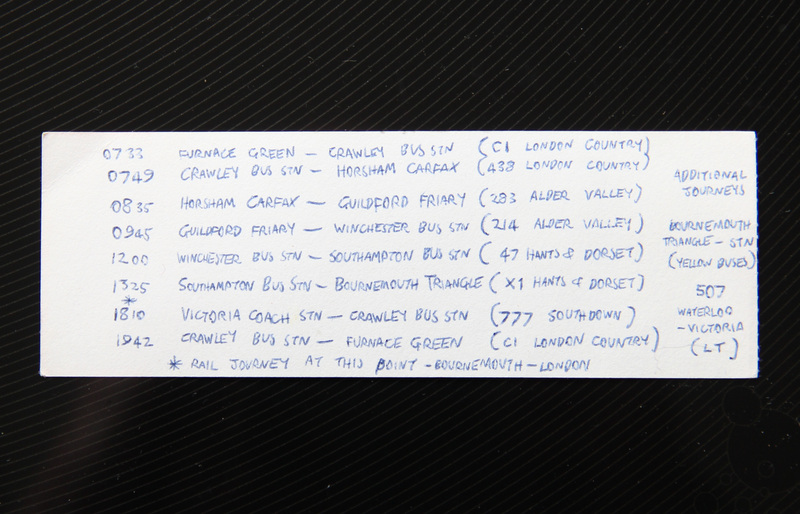 The journey, including timings as recorded on the back of the ticket. 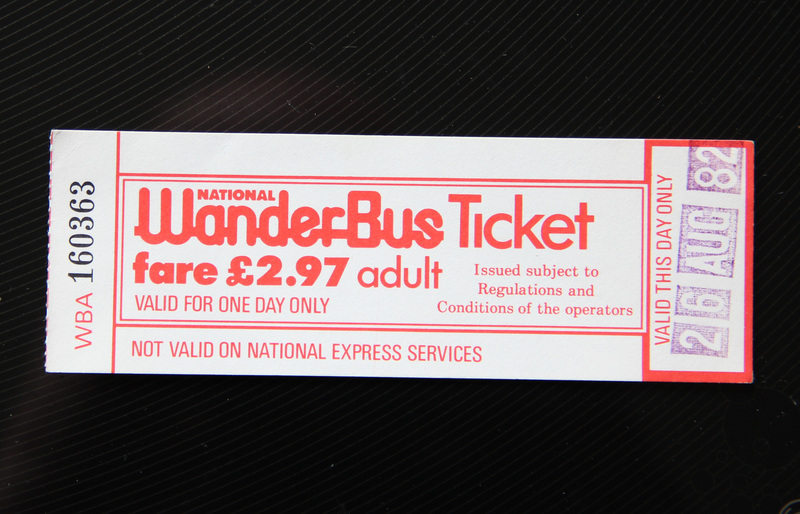 ‘National Wanderbus’ gave way to ‘Explorer’ tickets in the mid 1980’s. The ‘Explorer’ lived on into privatisation but was dogged by the politics of the individual companies. Trying to re-create this journey in 2000 became fraught with problems. All was well until I reached Southampton when I was informed that neither Wilts and Dorset or First group buses could accept ‘Explorer’ tickets issued by my (then) local company Arriva . It was a nice idea while it lasted. So, that was my mega-day out with a National Wanderbus. But how far did you get? I’d love to read of your long bus journeys, be it with a ‘Wanderbus’, ‘Busranger’, ‘Explorer’, ‘Rover’, or even on individual tickets. Send me your experiences in the ‘comments’ section below. MANY YEARS AGO I VENTURED FROM BOURNEMOUTH VIA SALISBURY,ANDOVER,NEWBURY READING,LONDON VICTORIA OXFORD AND THEN BIRMINGHAM ON A WANDERBUS TICKET TAKING 15 HOURS LEAVING BOURNEMOUTH ON THE 07.05 X1 WILTS AND DORSET SERVICE TO RINGWOOD TO CATCH THE X3 TO SALISBURY AND ARRIVING BIRMINGHAM AT 22.35 TIRING BUT VERY INTERESTING JOURNEY JUST £2.97. Thank you for sharing your journey with us David, that was a real marathon! I’m assuming it was Alder Valley ‘Londonlink’ from Reading to London then the Oxford-South Midland 190. As with the Green Lines in my neck of the woods the ability to use Wanderbus tickets on these services allowed a lot of ground to be covered. PS my sincere apologies for the late publication of your post and the subsequent reply. For some reason we didn’t receive notification of it’s arrival, we think this has now been put right!